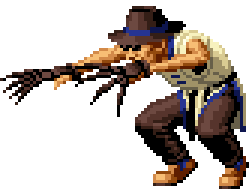 Choi Bounge (Korean: 최번개, Japanese: チョイ・ボンゲ) is a criminal on rahabilitation and one of the original members of the KOF Korean Team, along with Chang Koehan and Kim Kaphwan. In Korean, 'Bounge' means 'lightning'. He was a late-night predator who chanced to have stalked on Kim Kaphwan during one of his nightly walks. After he was bested by his prey, Choi was forced by Kim to undergo his "Rehabilitation project", in hopes of using the criminal's skills not "in the name of evil." During this time, he also met and befriended fellow criminal, Chang Koehan. Since then, the two have attempted to escape from Kim's training with little success, stressed often to the point of comic relief. This page was last edited on 21 November 2008, at 18:25.